Note: This is a modified version of a review already archived elsewhere. I wrote the original March 9th, 2012 on the website LibraryThing. 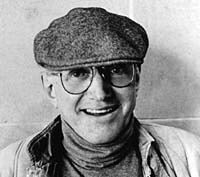 It seems to me a shame that nobody reads John Hawkes (1925-1998) these days. Part of the reason is that it seems like he was a really nice guy (see here) but most of the reason is that he was a talented and distinctive stylist with a literary vision that was unique. Among the postmodernist crowd of the 60s-70s he seems to come in last. Pynchon, Vonnegut and Gaddis wrote modern classics, Barth retains popularity, even William Gass has achieved a certain infamy for his fictions. But who reads Hawkes? It seems people are more likely to pay lip-service to him than actually read him – at least in America; the French apparently liked his work. 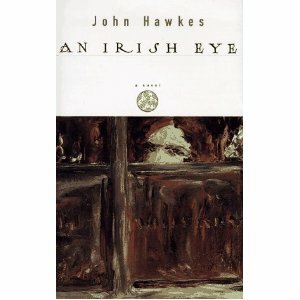 John Hawkes’ last novel, 1997’s An Irish Eye is in a notably lucid style, quite at odds with the prose of his early works, but that’s not to say it’s entirely normal. It’s narrated by thirteen year old foundling Dervla O’Shannon, who seems at first glance to be the sort of Irish girl you might expect to find in fiction – cheerful, plucky and rambling brightly on with only the vaguest sense of formality. Over the course of this short novel, she runs off with Teddy Stack, an old soldier from the Great War, driven by boredom to sham senility. From their new abode, Dervla writes home fanciful, inanely pious letters until the day their lives coincide with those of a decaying aristocratic family. In a sense, this could be considered a coming-of-age story, as Dervla has her first encounters with oppression, insanity, injustice and sexuality. And yet, even as her letters begin to develop parallels in reality, even as she is pawed over by almost every male in the story (Teddy being a notable exception) she accepts everything with a docility strangely at odds with her impish narration. As she waits for a chance to escape from her new situation, her innocence begins to sound more and more like coyness. In the coming-of-age yarn, the hero/heroine gains new perspective, accomplishes something and is changed forevermore. Therefore, this can’t be a coming-of-age yarn: Dervla accomplishes nothing. Some people say that late-Hawkes refuted his original claim that “the true enemies of the novel were plot, character, setting and theme,” but this quote cuts both ways. On the one hand, Dervla’s character dissolves as this story progresses, making her harder and harder to define as a person. The other characters float through their scenes in a similarly unmoored fashion. The story hardly depends on “character” in any meaningful sense of the word, and the plot has all the logic of a peculiarly vivid dream. It was a mean and frightening sight from empty road to distant horizon everywhere we looked, and never the same but closed in there by black slopes of barrenness and there by a stand of distant trees inside a circlet of the cruelest briars. Miles away from where we rode a miserable stone bridge lifted its broken back over a swollen stream, and fields and woods and distances and roads were all the same, every one of them, so empty that there must be unfriendly figures lurking where we could not see them but knew they were. Sometimes there was the sound of hounds with their jaws open, sometimes a black rain that passed us by or trapped us unaware in its downpour. There were hills and crags far off and empty cottages closer by. More potent and pleasing grew the pig’s aroma, golden because its plumpness as Mrs. Grant ladled the poor creature’s own melted fat back over its broad tender self, with the little tail tightening and the eye sockets growing emptier and wetter by the moment, and the little teeth increasingly exposed as if that shining animal were grinning at his own plight, as he well might have done. Oh, but I could not grin at mine. Later on, having dropped the platter, which was much too heavy for a child to be carrying anyway, she picks it up off the floor as this Anglo-Irish family look on: Oh, there was nothing for it but to haul him onto the slant of my knees and to grip him top and bottom as I would a rebellious child, and I did so and lifted him as high as my chest all covered by this time with the slime of his golden skin. And stood up, tottering. And with my own hands returned him to the platter, for which they might have thanked me or sighed in unison, as I thought as inadvertently I wiped the sweat from my face and thereby smeared my face with the grease of the pig who was lying askew on the platter feet up instead of on his stomach with his feet tucked tidily underneath. On the platter exactly as he had been on the floor, as they deserved, I thought, and stumbled like the light from that cold room. In Hawkes’ fanciful, deranged vision Ireland is not merely a landscape, it is a land where human beings will molder behind one wall or another, no matter their position in life (observe the closed-off worlds of the foundlings, the old soldiers and the aristocrats); where a thirteen-year-old girl will never be treated like a child; where identity and motivation become more and more inscrutable the closer you look and where a casual outing can lead to chaos. All told, it’s pretty disturbing stuff…but the one real problem with the book is its lack of emotional involvement. My feelings while reading An Irish Eye vacillated between disconcertion and bafflement, rarely anything else. Often I found myself thinking it would make a fantastic art/foreign film, though I don’t suppose that will ever be done. As a work of prose, it is an unexpected curiosity. I think John Hawkes deserves a revival and this is recommended to those of you who prefer the strange and obscure. Sounds really interesting to me! As I read your review, I wondered to myself if you read TomCat’s reviews and whether he has an answer to the question. They are all new to me, but I like to hear the discussion and admire the way you are able to analyse their depth. In another sense, it almost doesn’t matter, if it speaks to you then that is the most important factor. TomCat in the Red Room? I’ve read everything he’s published on his blog. One of my favorite reviewers. I’ve got him on my blogroll (hope he doesn’t mind) and only wish he was more prolific. Yes, I’m a follower of his blog also and really admire (am in awe of) his insights and analysis into literature, you perhaps saw his comment on the short story post. I am sure he doesn’t mind the link, he is very modest and I love to encourage him because he has a real talent he almost doesn’t recognise, which I am sure will take him places.